Ford has revealed the all- new Focus ST which will go on sale across Europe this summer. It is developed by Ford Performance to deliver nimble hot-hatchback thrills in a stylish, comfortable and practical family car. The new ST builds on the class-leading driving dynamics of the fourth generation Focus in five-door and wagon body styles. Ford claims that their new C2 architecture is enhanced with unique suspension, braking and powertrain configurations for the most responsive and agile Focus ST driving experience ever on road and track alike. A new engine line-up claims to driver up to 12 percent more power and 17 percent more torque compared with the previous generation Focus ST, adding that Ford’s 280 PS 2.3-litre EcoBoost petrol and 190 PS 2.0-litre EcoBlue diesel engines both deliver a broad spread of power and torque across the rev-range, for fast-revving sports performance. Ford also boasts that first application of an electronic limited-slip differential (eLSD ) for a front-wheel drive vehicle further enhances as standard the cornering and stability of the EcoBoost-powered variant – sharpening responses to changing grip levels and driver inputs using computer-controlled pre-emptive actuation. 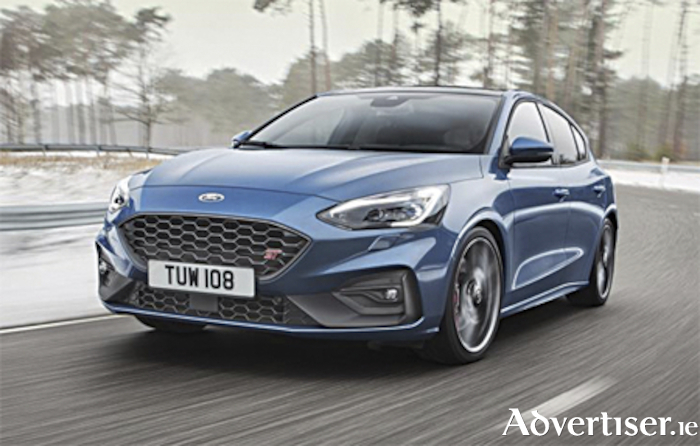 A choice of six-speed manual or quick-shifting new seven-speed automatic transmissions is being offered, and ‘Selectable Drive Modes’ technology is introduced to the Focus ST for the first time, enabling drivers to adjust the vehicle’s character to suit the driving scenario. ‘Continuously Controlled Damping’ (CCD ) will be standard for five-door EcoBoost variants. The blue oval brand tells us that this enhances the short long arm (SLA ) independent rear suspension configuration for ultimate refinement. The all new Focus ST will be manufactured in Germany following a €600 million investment at Ford’s assembly facility there. More on the all new Focus ST closer to the Irish launch date.